Looking for Garment Machinery ? They are free from corrosion.They have lower operational &maintenance cost.They have compact design. Fashion and sew the cloth into clothes. The fabric shifting mechanism may be a simple workguide or may be pattern-controlled such as jacquard type. Some sewing machines have a work holder frame or a work-feeder that can move along a curved path, or a work-feeder with a work clamp. The industrial market has come to be dominated by several prominent brands such as Juki, Brother Industries, Merrow, Durkopp Adler, Pfaff, Consew to name a few. Prior to the invention of the sewing machine, everything was sewn by hand--an art form that is over 20,000 years old. Archaeologists have discovered bone needles with eyes, used to sew together skins and furs, dating back to this time. This proved that the first sewing needles were made of bones or animal horns and the first thread was made of animal sinew. Iron needles were invented in Germany, dating to the third century BC and the first eyed needles appeared in the 15th century. 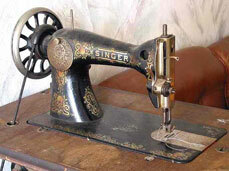 By 1920s, the electric motor was added, which revolutionized the history of the sewing machine. 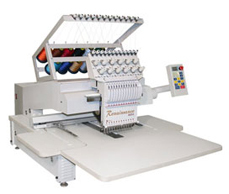 It decreased the cost of the machine as well as cost of stitching, thus expanding the range of an infinite number of clothing manufacturers and stores. Most modern sewing machines, especially used for bulk production of cloth, are computer controlled and use stepper motors or sequential cams to achieve very complex patterns. Most of these are now made in Asia and the market is becoming more specialized with the demand going higher and higher. A loom is a device for weaving thread or yarn into textiles. In the process, it holds the warp threads under tension to facilitate the interweaving of the weft threads. Loom is available in the form of small hand-held frame, large free-standing hand loom, automatic mechanical device, electrical cable assembly or harness (wiring loom), etc. 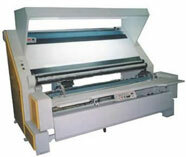 Dobby loom, Jacquard loom, and power loom are most widely used types of looms. A Dobby Loom, an alternative to a treadle loom, is a type of floor loom that controls the warp threads using a device called a dobby. In a manually operated dobby, a chain of bars or legs is used, each of which has pegs inserted to select the shafts to be moved. The selected shafts are raised or lowered by leg power. Solenoids or other electronic devices are used in a computer assisted dobby loom to select the shafts. Activation of these solenoids is under the control of computer program and the selected shafts are raised or lowered on a dobby pedal or electric or other power sources. Dobby looms first appeared around 1843. An eight shaft loom can create 254 different sheds and with a dobby loom, all 254 possibilities are available at any time. This facilitates the weaver to design an increasing number of cloth designs. The advantage of a dobby loom becomes more pronounced on looms with 12 shafts (4094 possible sheds), 16 shafts (65,534 possible sheds), or more. Another advantage of using a dobby loom is the ability to handle much longer sequences in the pattern. The sequence that makes up the pattern on a manual dobby loom is represented by the chain of dobby bars. The length of the sequence is limited by the length of the dobby chain. A computer controlled loom can handle unlimited sequences with many newer cloth design techniques such as network drafting reaching their full potential. The Jacquard Loom is a mechanical loom, which utilizes holes punched in pasteboard, each row of which corresponds to one row of the design. Multiple rows of holes are punched on each card and the many cards that comprised the entire design of the textile are strung together in order. Each hole in the card corresponds to a hook, which raises or lowers the harness that carries and guides the warp thread. The sequence of raised and lowered threads creates the pattern. Each hook can be connected via the harness to a number of threads, allowing more than one repeat of a pattern. Modern jacquard looms are computer controlled and can have thousands of hooks. The Jacquard Loom was invented by Joseph Marie Jacquard in 1801, based on earlier inventions by Basile Bouchon, Jean Falcon and Jacques Vaucanson. In the history of cloth related machinery, the Jacquard loom was the first machine to use punch cards to control a sequence of operations. Power loom is a mechanized loom that is driven by driving shafts, allowing large amounts of cloth to be made in a short span of time, a quantity which cannot be accomplished manually. It was initially operated on water power, which required workshops equipped with power looms to be located near a source of running water. By the start of the 19th century, steam power started to be used after James Watt's invention of the advanced steam engines and others. Power loom was one of the key inventions of the Industrial Revolution, and this machine was fully developed and utilized after 25 years of the revolution. Edmund Cartwright first designed the power loom in 1784 and it was first built in 1785. Later on, William Horrocks perfected the design of the power loom, making it fully usable and efficient. Initially, power looms were shuttle-operated but in the early part of the 20th century, the shuttleless power loom came into use. With the advancement of technology, a variety of looms were designed to maximize production for specific types of material. These include are air-jet looms, water-jet looms, computer-driven looms and industrial looms. Industrial looms have a capacity of weaving at speeds of six rows per second. With the introduction of the flying shuttle patented by John Kay in 1733, the power loom has become a common product in most factories. Light on the upper and lower parts, this machines has compact structure and is easy to operate. It is equipped with accurate photoelectric hydraulic pressure margin-neat setting and the stable tensility adjusting system is controlled by electronic parts to control the cloth tensility. The stepless adjusting setting, used to adjust the tightness of rolled textiles, is one of its advantages. It has a figure displaying meter and yard machine facilitating the user to automatically stop when desired. The frequency conversion system adjusts the speed of the electric decelerator machine to the specific requirement.